Market Surveys of America are annual surveys designed for each specific region to determine the best of the best companies in their community. “These surveys are big in our area, so it’s a special honor to be acknowledged two years in a row. We are so grateful for all of our customers and could not have earned this recognition without the excellent work ethic of our employees,” said Lara Clark, director of marketing for Bouchard Cleaning & Restoration. To learn more, visit www.bestofsurveys.com. With over 75 years of combined experience in the restoration industry, Bouchard Cleaning & Restoration DKI’s provides 24/7 emergency mitigation services in Bangor, Maine. 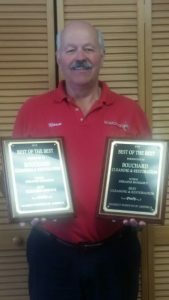 While maintaining the industry’s highest standards, Bouchard Cleaning & Restoration DKI’s team is skilled in the fields of commercial, residential and multi-family properties, and is known for its technical excellence and the ability to handle any size loss. To learn more, please visit www.bouchardcleaning.com.